We learned created ec2 instance previous tutorials.You can find this link.A spot instance is an offering from AWS; it allows an AWS business subscriber to bid on unused AWS compute capacity. 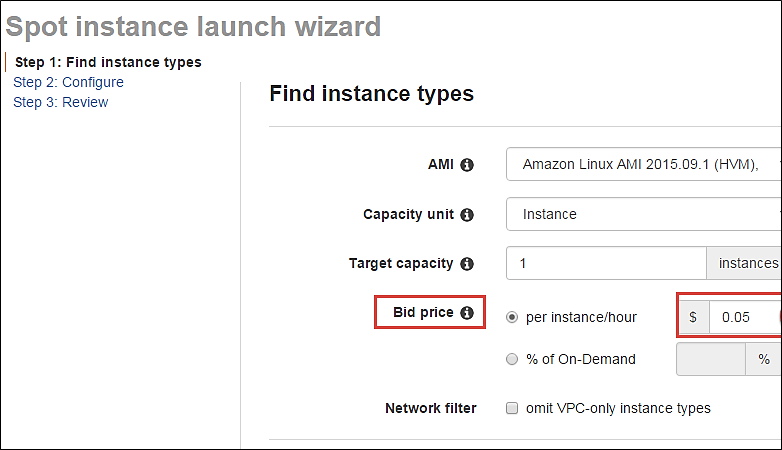 The hourly price for a Spot instance is decided by AWS, and it fluctuates depending on the supply and demand for Spot instances. Your Spot instance runs whenever your bid exceeds the current market price. 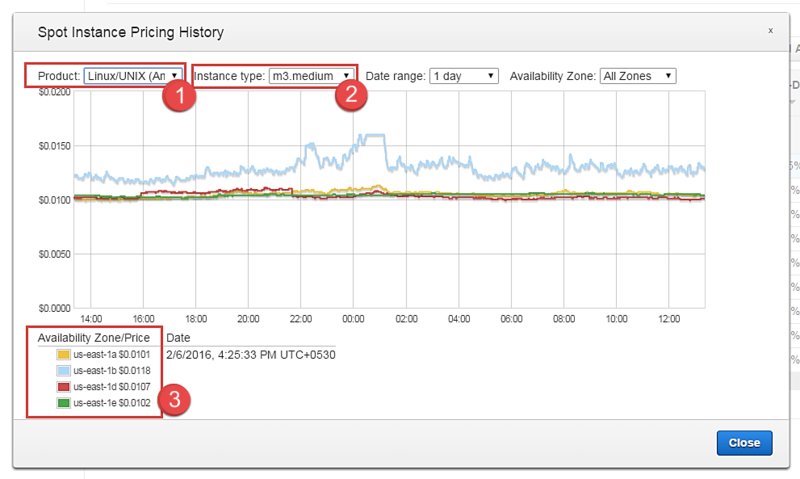 The price of a spot instance varies based on the instance type and the Availability Zone in which the instance can be provisioned. When your bid price exceeds the market spot price of the instance called as the ‘spot price,’ your instance stays running. 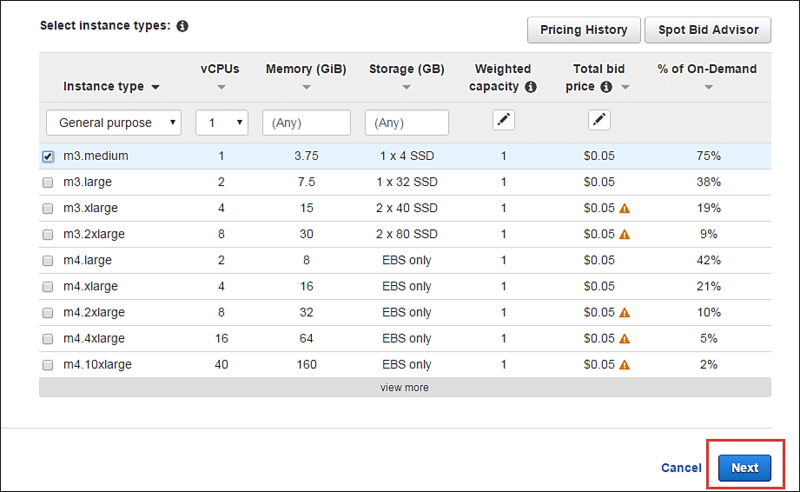 When the spot price overshoots the bid price, AWS will terminate your instance automatically. Therefore, it is necessary to plan the spot instances in your application architecture carefully. According to Amazon, Spot Instance prices are typically more than 75% lower than On Demand prices. A common use for AWS spot instances is high-performance computing (HPC), in which firms that are performing financial or scientific analysis spin up hundreds or thousands of machines for a short time. Spot Instances are not well-suited for real-time or mission-critical services such as Web applications. 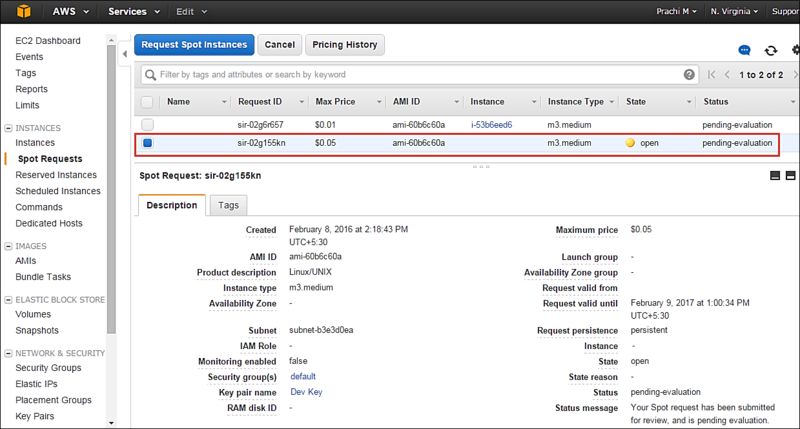 Step 1) Login to your AWS account and go to the AWS Services tab at the top left corner. Here, you will see all of the AWS Services categorized as per their area viz. Compute, Storage, Database, etc. 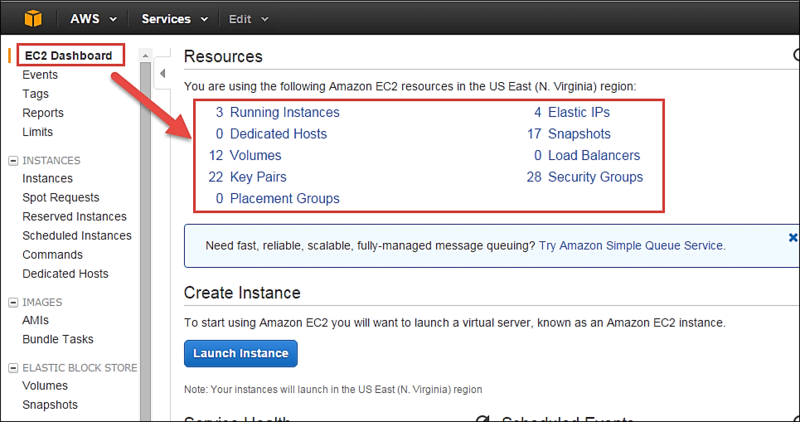 For creating an EC2 instance, we have to choose Computeà EC2 as in the next step. 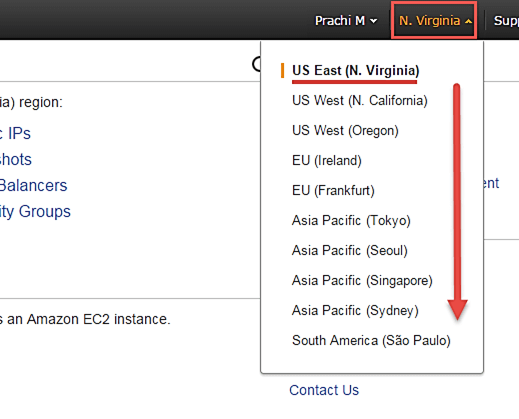 Step 3) Once your desired Region is selected, come back to the EC2 Dashboard. In order to launch a spot instance, you have to first create a Spot Request. Follow the steps below to create a Spot Request. 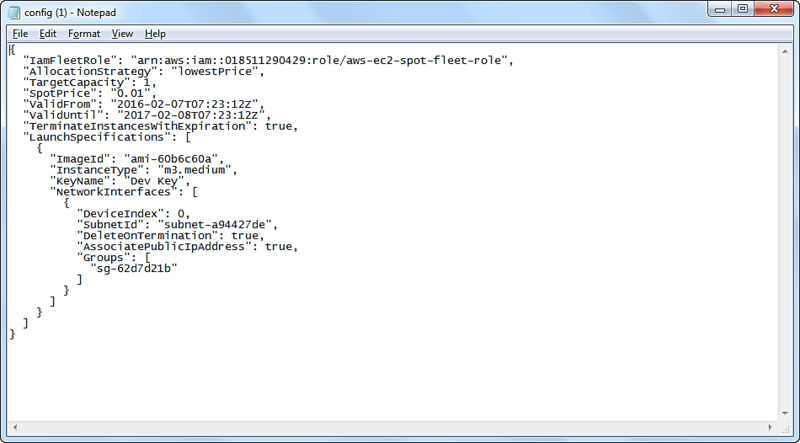 On the EC2 Dashboard select ‘Spot Requests’ from the left pane under Instances. Click on the button ‘Request Spot Instances” as shown below. 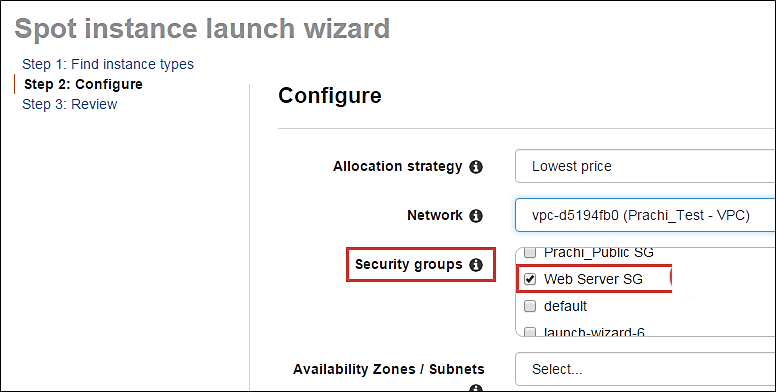 Spot instance launch wizard will open up. 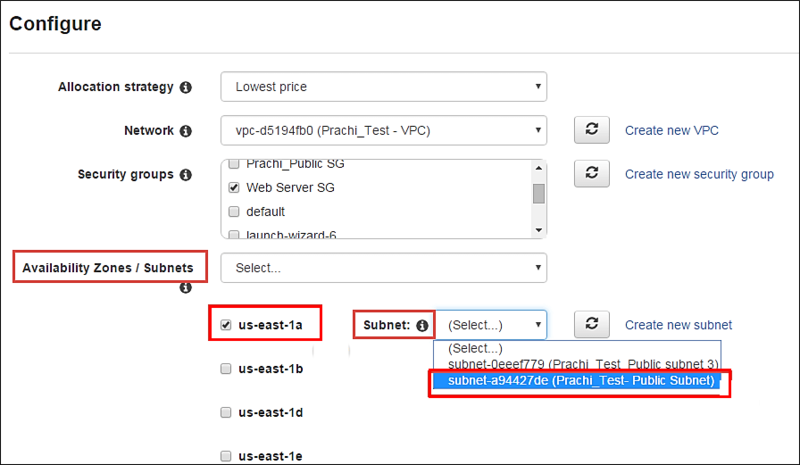 You can now go ahead with selecting the parameters and the instance configuration. Step 1) Select an AMI- an AMI is a template consisting of the OS platform and software to be installed in the instance. Select your desired AMI from the existing list. 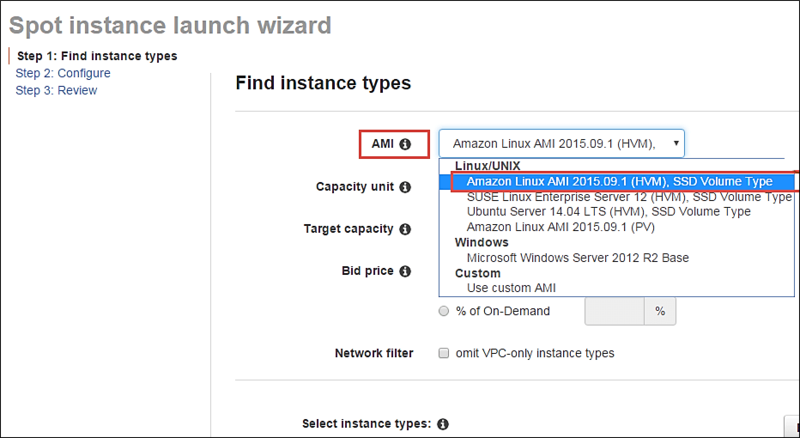 We are selecting Amazon Linux AMI for this tutorial. Step 2) Capacity Unit- a Capacity Unit is your application requirement. You may decide to launch an instance based on the instance type, vCPU or custom configuration like your choice of vCPU/memory/storage requirements. Here we are selecting an Instance. 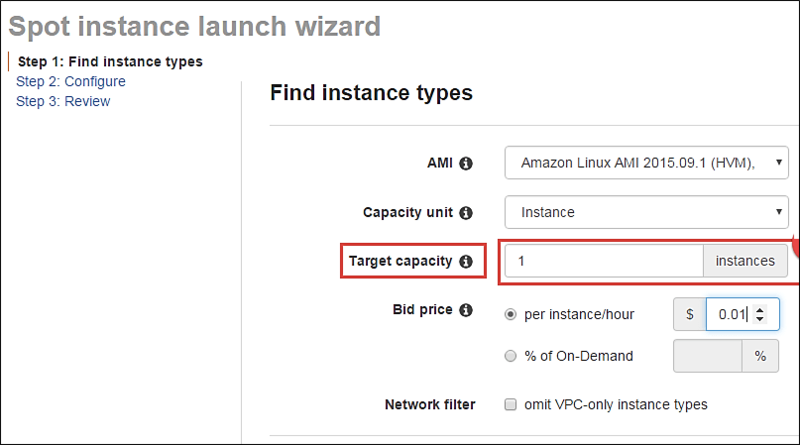 Step 3) Target Capacity depicts how many spot instances you wish to maintain in your request. Here we are selecting one. Step 4) Bid Price – this is the maximum price we are ready to pay for the instance. We are going to set a particular price per instance/hour. This is the simplest to calculate based on our business requirement. We will see ahead how we should determine the bid price so that our bid price always remains high and doesn’t exceed the spot price so that our instance keeps running. just below the bid price you can see a button of Pricing History. Click on that as shown below. Here in Pricing History, we can see a graph depicting instance pricing trends with historical data. You can select the parameters and get an idea of the pricing of our desired instance over a period of time. Select the product. We have selected our Linux AMI. Select the instance type. We have selected m3.medium. Note the average prices for over a day here. Thus, from the chart below, we can see that the instance type that we are planning to provision lies in the pricing range of $0.01xx, and it seems that Availability Zone ‘us-east 1a’ has the lowest price. So let’s come back to our step of quoting a bid price. For the sake of maintaining our instance always available and if it falls within our budget, we can quote a higher bid price. Here we have quoted a slightly higher price of $0.05. You can see some trends in the wizard itself. Note the price that we are planning to bid. % of on-demand shows us that our quoted price is 75% of the on-demand price for the same instance type. This means we are saving 25% per hour as compared to an on-demand instance. You can further lower the price and save costs drastically. Step 5) Once we are done looking at the trends and quoting our bid price, click on next. Our next step is to configure the instance, in this step of the wizard, we’ll configure instance parameters like VPC, subnets, etc. For this tutorial, we’ll select Lowest Price as our allocation strategy. Step 2) Select the VPC- we’ll select from the list of available VPCs that we have created earlier. We can also create a new VPC in this step. Step 3) Next we’ll select the security group for the instance. We can select an already existing SG or create a new one. 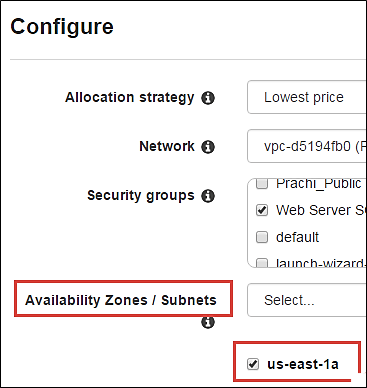 Step 4) Availability Zone- we’ll select the AZ where we want to place our instance based on our application architecture. We are selecting AZ- us-east-1a. Step 5) Subnets- we are going to select the subnet from our list of already available list. 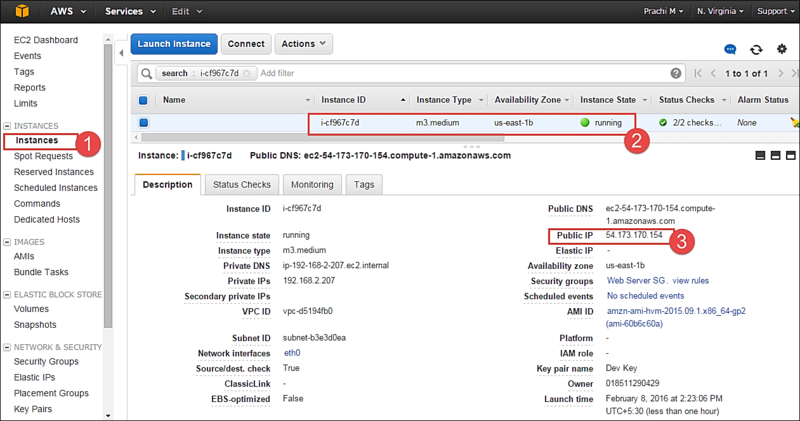 Step 6) Public IP- we’ll choose to assign the instance a public IP as soon as it launches. 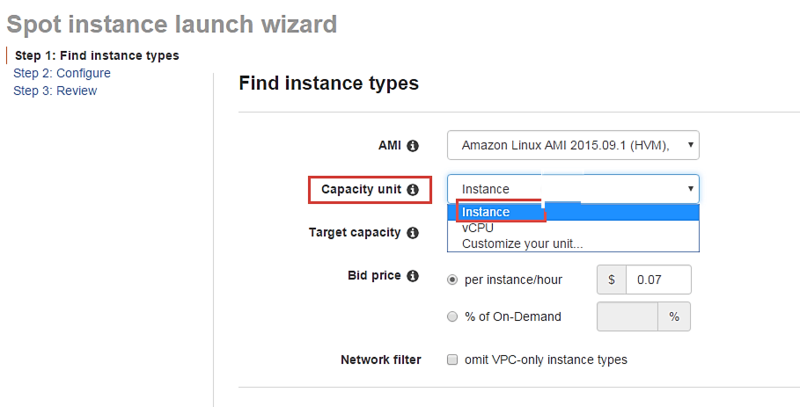 In this step, you can choose if you want AWS to assign it an IP automatically, or you want to do it manually later. You can enable/ disable ‘Auto assign Public IP’ feature here likewise. Step 7) Key pair- A key pair is a set of public-private keys. After selecting public IP, here we are selecting a key which we already have created in our last tutorial. 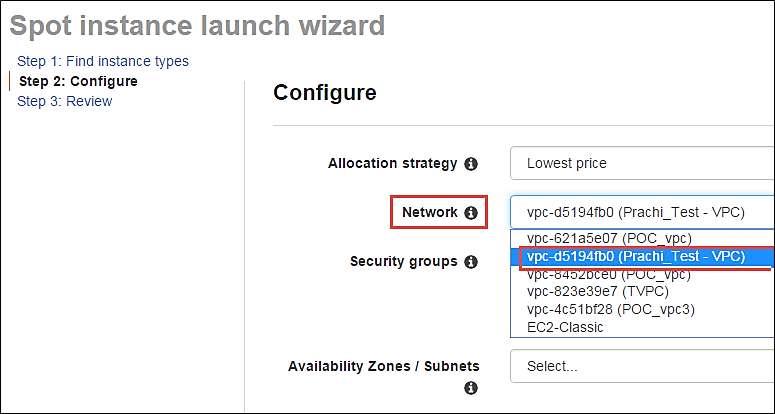 Once we are done configuring our spot instance request in the 2 steps earlier in our wizard, we’ll take a look at the overall configuration. We can also download a JSON file with all the configurations. Below is our JSON file. After we are done reviewing, we can proceed with the launching by clicking the Launch button as shown below. Once we select Launch, we can see a notification about the request getting created. 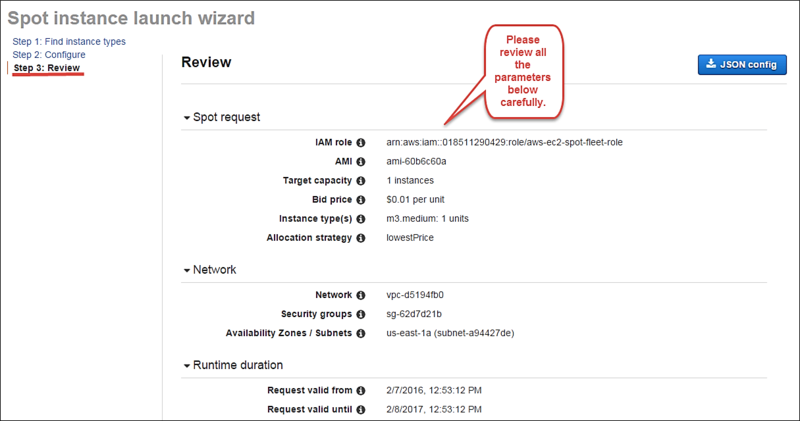 The spot request creation wizard will close, and the page will automatically direct back to the EC2 Dashboard. You can see as shown below that the State of our request is ‘open’ which means that it is getting evaluated from the AWS’s side. 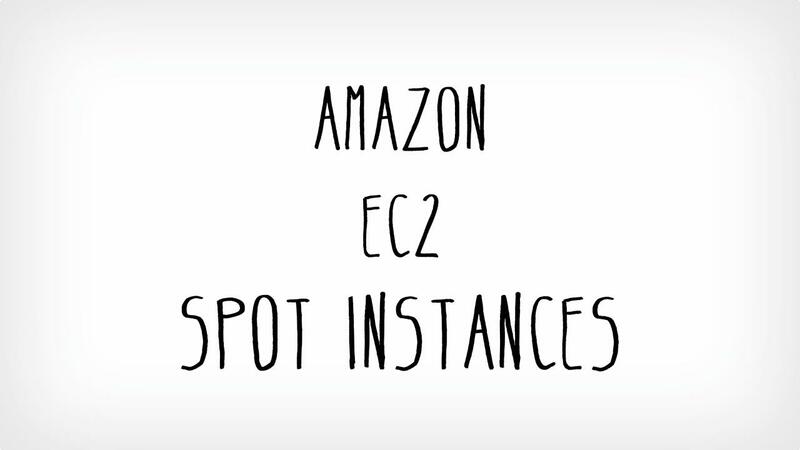 AWS EC2 will check if the required instance is available in its spot pool. After a couple of minutes, you can see that the state is changed to ‘active’, and now our spot request is successfully fulfilled. You can note the configuration parameters below. Step 2) Open putty in your computer. Click open button You can now connect to your instance. Here, we saw how to create a Spot Instance request successfully by determining our bid price. Spot instances are a great way to save on costs for instances which are not application critical. A common example would be to create a fleet of spot instances for a task such as image processing or video encoding. In such cases, you can keep a cluster of instances under a load balancer. 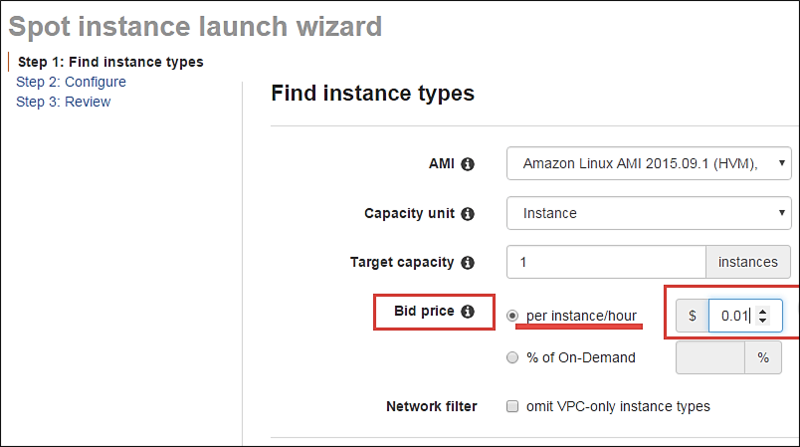 If the bid price exceeds the spot price and your instance is terminated from AWS’s side, you can have other instances doing the processing job for you. You can leverage Auto scaling for this scenario. Avoid using Spot instances for business critical applications like databases etc.